An indulgent and decadent Easter cheesecake with a layer of caramel and chunks of caramel Easter eggs baked in, topped with milk chocolate ganache, more caramel and more Easter eggs! Easter is upon us. Or as we like to call it in my household, Chocolate Christmas. What I first envisioned when I was dreaming up an Easter recipe was a Cadbury Creme Egg Cheesecake. But bunny help me, I just don't like Creme Eggs! I know they're all the rage and we're all supposed to be whipped up into a mad buying frenzy when January rolls around and the supermarkets start putting out their Easter wares. Anything made up of this is gonna be good. But I just think they're too sweet. And that might sound strange from someone who calls herself Cassie Cakes but it's the truth. So there I was, rolling ideas around, bouncing them off my friends to see what they thought but I just wasn't getting the excitement in my waters. Until I realised, "hold on, this is MY recipe! I can make whatever I like!". And so I give you my Caramel Easter Egg Cheesecake! Giving the food processor its well deserved glory. People seem to get upset each year when the Easter eggs start popping up in the shop, as though the Easter bunny got dementia and forgot when he was supposed to come. But personally, I think it's great! How could longer to enjoy delicious, delicious Easter chocolate be a bad thing? Making caramel the easiest way ever! I don't want to blow my own horn but this is seriously one of the best cheesecakes - if not THE best cheesecake - I've ever had. TOOT TOOT! What we have here is a classic vanilla baked cheesecake with a layer of dulce de leche (Latin American caramel) and chopped caramel Easter eggs in the center. Then, because too much of a good thing is never enough, a layer of smooth and silky milk chocolate ganache is poured on top followed by lashings of more dulce de leche. Whole caramel Easter eggs are arranged around the outside and boom. Mind blown. Okay now I think the food processor might be getting a big ego. It might be a justified ego...look at the smooth, cheesy goodness. Cheesecake is my jam. I love it. I love the texture and the taste...there's simply nothing else like it in this world. Some people will try and tell you that a cheesecake doesn't have to be baked, that you can make what they call a "set cheesecake" but those people are liars and you don't need that in your life. Team Baked. Team Baked FOR LIFE. Tiny peaks of chocolate hinting through. I have a big old food processor that I hardly ever use. I love it, it's one of my appliance children but it's definitely the child I leave in the cupboard with it's brother, The Juicer, cos frankly, I can't be bothered washing them up. But this cheesecakes gives you a chance to bring the neglected child out of the cupboard and give it a bit of well deserved glory. Use it to crush the biscuits then after, pop all the cheesecake ingredients in and give them a good processing. If you don't have a food processor, a hand or stand mixer will be more than adequate for the cheesecake mix and there's nothing wrong with bashing some biscuits with a rolling pin. Now a note on dulce de leche. It is so easy to make at home but you do need to keep on eye on it. To make, place a whole can of sweetened condensed milk (for this recipe you'll need two) on it's side in a heavy-based saucepan and cover completely with water. Simmer for 2 hours, ensuring the can is always covered with an inch or two of water. If you allow the can to simmer uncovered, it can explode. And that would be a mess to clean up. A delicious mess, but a mess nonetheless. If this sounds too time consuming, you can buy a can of Top 'n' Fill from the supermarket - it's basically exactly the same. I just like doing things the long way. But oh what a cheesecake. I can't say that this is a quick dessert, but it's not hard, just time consuming. And since you have a whole long weekend coming up, why not give it a go? I give you my word that you'll love it. Unless you don't like deliciousness and then I don't even know why we're friends. Bring to a simmer and simmer for 2 hours, topping up with water regularly. DO NOT LEAVE UNATTENDED. Carefully remove from water and allow to cool before opening. Once cooled, decant into a bowl and vigorously beat with a fork to make smooth. Set aside until required. Melt butter and use a pastry brush to brush the base and sides of a 24cm spring-form pan with melted butter. Set remaining butter aside til required. 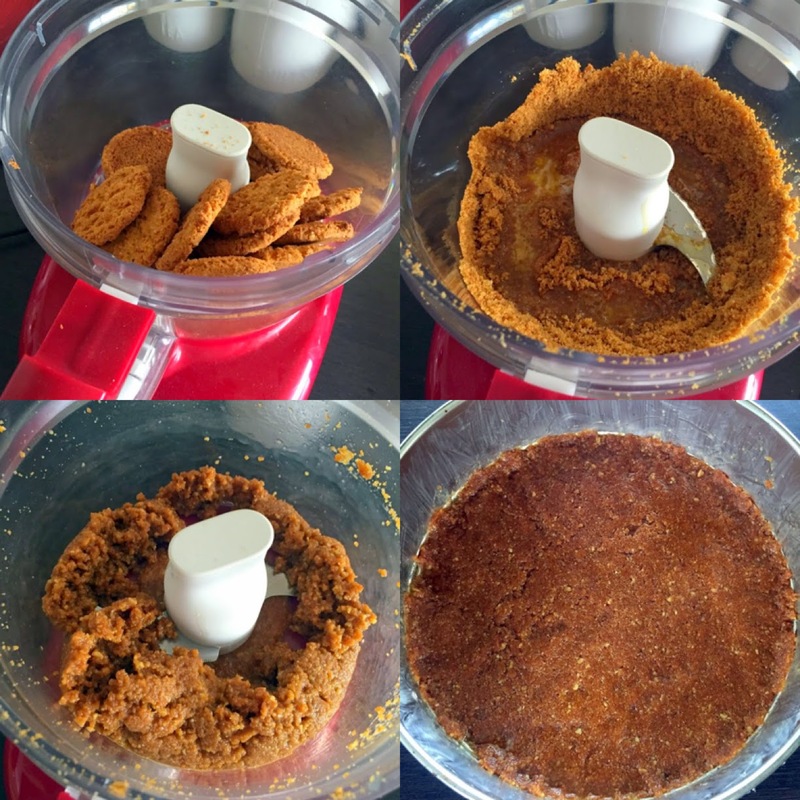 In the bowl of a food processor, process butternut biscuits until fine. Alternately, place biscuits into a freezer bag and crush with a rolling pin until fine. Add the melted butter to the biscuits and pulse until the biscuits begin to pull away from the sides. Press the biscuits firmly into the base of the prepared pan then refrigerate until required. Wipe out the food processor bowl then place remaining ingredients into the bowl and process until smooth. Pour half the cheesecake mix into the biscuit base then return to the refrigerator. Set aside 14 of the caramel Easter eggs, then roughly chop the remaining eggs. Spoon 3/4 of the dulce de leche mix onto the cheesecake, then top with chopped Easter eggs. Pour the remaining cheesecake mix on top, covering any lumps with the mix. Bake for one hour, then turn the oven off and allow to cool with the door shut for 10 mins. Leave the cheesecake in the over, after the 10 mins have elapsed, with the door ajar until cooled. Melt the chocolate in a large microwave proof bowl in the microwave in 30 second intervals. Once melted, add cream and stir to combine until smooth. Allow to cool slightly. Ganache should be pourable but not hot. Remove the cooled cheesecake from the refrigerator. Pour the ganache over the top of the cheesecake until completely covered. Arrange the reserved 14 Easter eggs around the outside of the cheesecake.